Men, you are in luck. Women, you are not, because Axe is sending 22 men—men—from around the world into outer space. 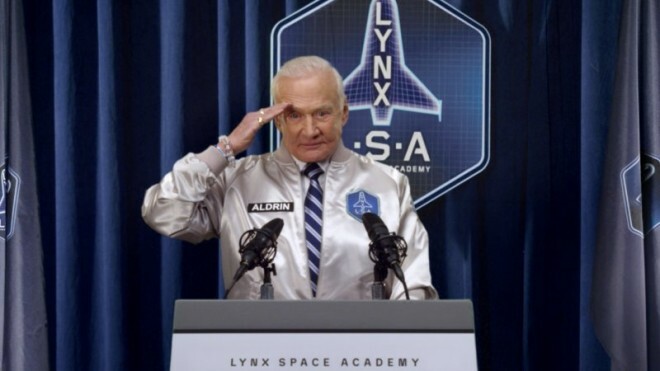 In a bizarre and slightly pitiful advert starring 82-year-old Apollo 11 runner-up Buzz Aldrin, Axe announced the opportunity to "leave a man ... and come back a hero." From January 9 through February 3, guys in the U.S. can enter to win a “bonus” ticket to space as a celebration of Axe’s decision to spend millions on a SuperBowl ad. (I would make fun of this, but it is promoting SPACE so I won’t.) For everyone else in the world: make a profile explaining why you should get to go to space—and then get everyone to vote on you. If you make it into the top tier, you do a country-specific “challenge” to determine a national champ. Winners from 20 countries move on to the ‘Space Camp’ round in Florida where high speed jets will flip you around, parabolic flights will get you weightless, and a centrifuge will crush you with either centripetal or centrifugal force. All of this is to determine who won’t freak out on a suborbital space jaunt on a (still untested, still in development) Lynx spacecraft. If the spaceship doesn’t fly by the end of 2020, the winner gets a check for $86k. Not space, but not too bad after seven years of waiting. If the idea of being strapped inside a space capsule filled with “fresh sage, crisp mandarin, and smooth sandalwood” spray does not appeal, then just look Buzz Aldrin in the eye. DO IT NOW. And think about how you’re letting down your country, Planet Earth, and, most importantly, men. If that’s still not enough, Mr. Aldrin would like to punch you in the face.